Three-term US Senator Lindsey Graham, a top cheerleader for the so-called ‘War on Terror’ and just about every other US military incursion around the world, has indicated he will run for the Republican nomination for president in 2016. 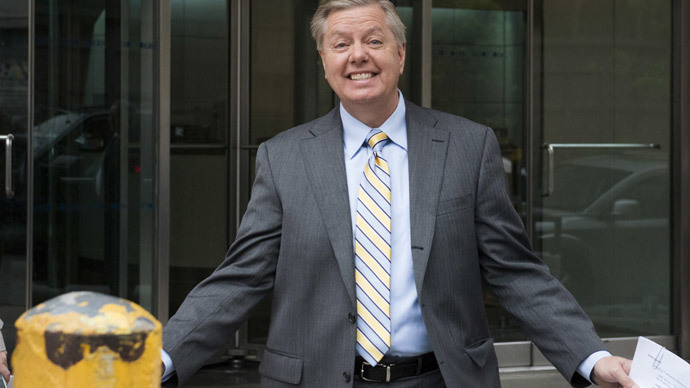 Graham said Monday he would announce his official decision on June 1 in his hometown of Central, South Carolina. But for now, it appears he will challenge the likes of fellow Senator Ted Cruz for support among the hawkish right wing of the Republican Party. “I’m running because of what you see on television; I’m running because I think the world is falling apart; I’ve been more right than wrong on foreign policy,” he said on “CBS This Morning,” when asked if his decision was based on fellow Republicans who have already joined the 2016 race. A diligent hawk who supports bloated Pentagon budgets, the neo-conservative senator is known for his bellicose views on foreign policy -- and the US military's place in that policy. He is also a former US Air Force Judge Advocate. While he may have aimed for tough-guy bombast during a March visit to the early presidential primary state of New Hampshire, Graham indicated at the event that his first act as president would be to use military force to demand Congress restore the moderate funding cuts to Pentagon and intelligence budgets that were approved by legislators in 2011 to address federal deficits. "And here’s the first thing I would do if I were president of the United States. I wouldn’t let Congress leave town until we fix this. I would literally use the military to keep them in if I had to. We’re not leaving town until we restore these defense cuts. We are not leaving town until we restore the intel cuts." Graham suggested Monday that the 2003 US military invasion of Iraq -- which had his vociferous support at the time and for years after -- was not based on sound intelligence. “Going into Iraq, if I’d known … then what I know now, would I have launched a ground invasion? Probably not,” he said. He added that if head known the “intelligence was faulty,” he would have “reconfigured” his strategy for confronting Saddam Hussein, who "needed to go." Graham was one of the biggest advocates for military intervention in Syria in 2013. "I don't care what it takes," Graham told Foreign Policy magazine. "If the choice is to send in troops to secure the weapons sites versus allowing chemical weapons to get in the hands of some of the most violent people in the world, I vote to cut this off before it becomes a problem." In 2010, he called for a pre-emptive US military attack to "neuter" Iran. Denouncing Sen. Rand Paul's 2013 effort to bring light to America's drone policy that has licensed the extrajudicial killing of Americans overseas, Graham said he found the mere premise of Paul's actions as "ridiculous." Graham has vigorously defended the vaguely-defined provisions of the 2011 National Defense Authorization Act that sanction indefinite detention (by the military, without trial) of American citizens the US government deems an enemy. "It is not unfair to make an American citizen account for the fact that they decided to help Al Qaeda to kill us all and hold them as long as it takes to find intelligence about what may be coming next," Graham said in defending the NDAA. "And when they say, 'I want my lawyer,' you tell them, 'Shut up. You don't get a lawyer.'" In June 2014, Graham threatened to push impeachment for President Barack Obama should he move to release any more prisoners held at the military detention center at Guantanamo Bay, Cuba. In fact, Graham has long supported indefinite detention without trial for Guantanamo detainees whose evidence against them amounts to information attained as they were tortured by American agents or proxy nations. Graham -- who currently occupies the US Senate seat previously held by Strom Thurmond, one of America's most infamous segregationists -- is an unabashed support of Israel's militaristic posture towards Palestinians and much of the Arab world. Speaking at the American Israel Public Affairs Committee (AIPAC) New England Leadership Dinner in Boston earlier this month, Graham said that “Al Qaeda, Al Nusra, Al Qaeda in the Arab Peninsula… Everything that starts with ‘Al’ in the Middle East is bad news,”according to investigative journalist Uri Blau. In reaction, Graham's spokesman said the quip was "not a serious policy statement" and that it was the senator's "humorous way" of making light of pressing issues. Domestically, he has said he was "glad" for the existence of the National Security Agency's vast surveillance operations that were first revealed in 2013 by former intelligence contractor Edward Snowden. Earlier this year, Graham told NBC News he had never once sent an email.